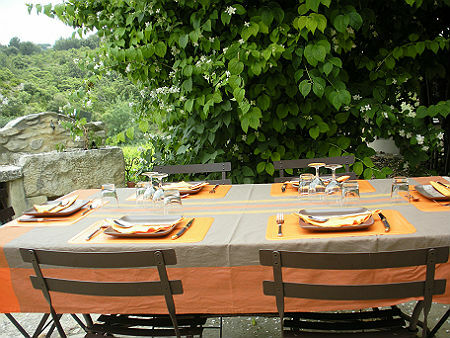 The holiday rentals/self catering service apartments are ideal if you want to be part of the French way of life, but keep your own schedule and habits such as having a wine and cheese, early rise breakfast,... in a word to have a home in Provence. Those cannot be rented for less than 4-5 nights within a week from saturday to saturday. See on the bottom of our page "our area" all the possible day trips and you may never want to leave ! 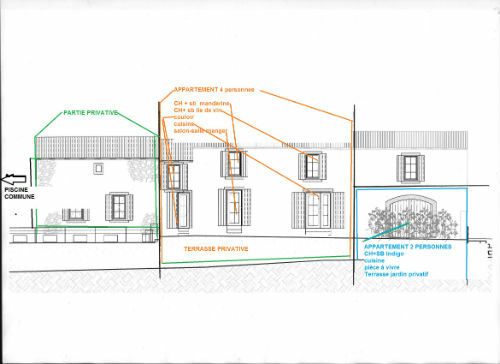 Our village farmhouse consists of 2 rental units ( One 4 person unit and one 2 person unit ) A complete renovation has enabled us to integrate modern comfort while maintaining the authentique provençal charm. The units are equipped with a dishwasher, cleaning material and -products are included. Bed sheets, bathroom towels, hand towels are furnished. 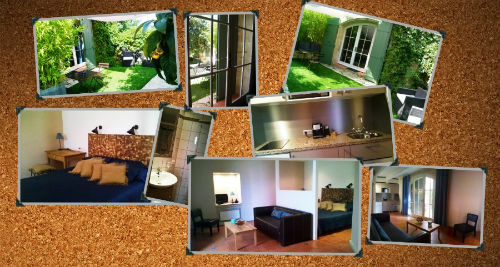 It is possible to rent both units at the same time, accommodating 6 people. No additional beds are available nor allowed on the property. Too assure a peaceful stay for all no visitors are allowed. Even though we love pets we can’t allow visitors to bring theirs. Rental is on a weekly base starting on a Saturday 5pm until the next Saturday 10am in the months of july and August. Any other month 4 days is your minimal stay, the arrival day is flexible. An inventory is available for information and some minor changes are possible with the respect of the same quality and comfort. Dining room/Living : Dining table, 8 chairs. Cabinet with dinnerware. 2 seats sofa and 2 armchairs, side table. Access to terrace through French doors. Kitchen : Open to dining- living area. Kitchen sink, Stove with 5 burners, 2 electrical ovens, micro-wave oven, dishwasher, fridge. Access to terrace through French doors. Terrace : Fixed charcoal BBQ, exterior ”authentique stone” washbasin. Dining table with four chairs. exterior Sofa and 2 armchairs , side table. Sun protection. Direct access from kitchen and dining area. Direct acces from hallway/staircase to 2nd floor bedroom area. Toilet : Independent with hand washbasin. Room 1 : Bed 160x200cm, night table, two armchairs, make-up table, chest of drawers, TV. Ceiling fan above bed. Window with view on terrace, vineyards and hillside. Private bathroom: Two washbasins, shower and toilet. Room 2 : Bed 160x200cm, table, two chairs, cabinet, TV. Ceiling fan above bed. Window with view on terrace, vineyards and hillside. Private bathroom: Washbasin, shower and toilet. Kitchen/Living : Kitchen: Open to living area. Countertop, sink, 2 burnerS cooktop ( induction), multifunction oven, dishwasher, fridge/freezer. All dinner- and cookware. Living, 1 chairs. 2 seat sofa, coffee table. TV. Access to private terrace/garden through French doors. Bedroom : Bed 160x200cm, table, stool, dressing. Private bathroom: Washbasin, shower and toilet. Terrace : table, 2 chairs, 2 armchairs sidetable. The village of Tavel has all commodities to purchase basic life necessities, also restaurants, Communal pool ( Olympic size ) and complimentary tennis courts are available. A main attraction is the wines in the region, Tavel boasts around 30 wineries, all within walking distance. Multiple trails surround our village through the vines or the countryside. The “ papal walled city” Avignon is at 12km/8miles. We have a bus reaching Avignon approximately every hour every day. The famous Roman aquaduct “pont du Gard” can be found at 18km/12miles. veuillez nous indiquer vos dates, ainsi que la composition du groupe (nombre d'adultes et nombre d'enfants avec leur age).